The Compass360 duo of Ryan Winchester and Brett Sandberg recorded the ninth and tenth victories of the season for the Honda Civic Si at the season-ending Grand Prix of Houston earlier this month, as Honda dominated the Touring Class Manufacturers’ Championship in the SCCA Pirelli World Challenge. In all, Honda drivers won 10 of 14 races in 2013, with only Michael Cooper’s mid-season string of four consecutive wins in his Mazda3 interrupting the Honda march to the manufacturers’ crown. Winchester successfully bookended his season to take the drivers’ championship, winning the final round at the Houston temporary street circuit to go along with victory at the season-opening round at Circuit of the Americas in Austin. Four more victories – for a total of six – and regular podium finishes in all but one round of the 14-race championship secured the title for Winchester. For his part, Sandberg scored four victories and four additional podium finishes, but a “no score” in the second Toronto race and a crash in the Houston finale left him second in the championship. Capping an excellent Pirelli season for Compass360, rookie Remo Ruscitti finished on the podium no less than seven times to finish third in the driver’s championship as the top rookie in the series. In the companion Touring Class-B category, veteran Joel Lipperini won rounds at Lime Rock Park and the Honda Indy Toronto to finish second in the TCB drivers’ championship in his Honda B-Spec Fit, just 30 points behind class champion Robbie Davis. 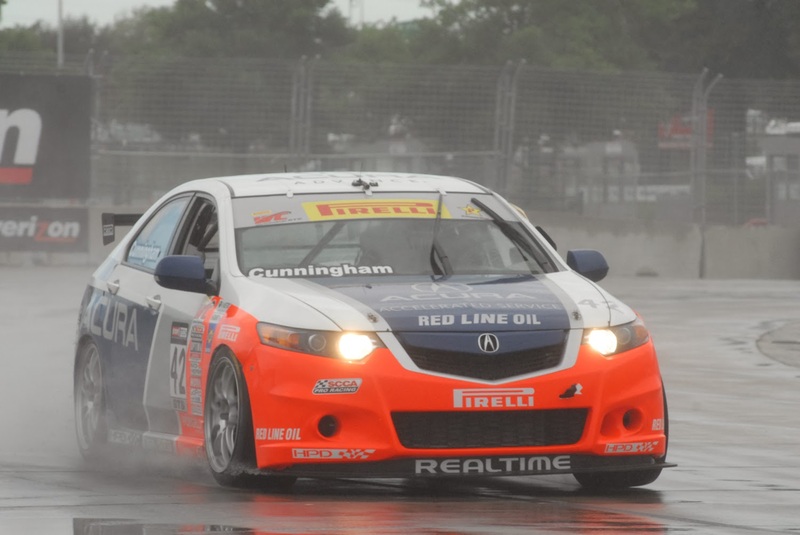 The Acura TSX-equipped RealTime Racing closed out their 2013 Pirelli World Challenge Season on a high note, with a second-place GTS class finish for team owner/driver Peter Cunningham at Houston. Early morning rain showers meant the combined GT/GTS race started on a fully wet circuit. The damp conditions proved an advantage for the front-wheel drive Acura, as Cunningham fought his way through the field, ending up in a multi-lap battle with the Porsche Cayman of Jack Baldwin. Once past Baldwin with just a handful of laps remaining, Cunningham attempted to chase down the Camaro of leader Lawson Aschenbach, but the checkers waved with Cunningham second, and teammate Nick Esayian ninth. Across the country, the Grand-AM’s Continental Tire Sports Car Challenge came to an exciting conclusion at Lime Rock Park in Connecticut. Unlike the otherwise similar Pirelli series, which are sprint races of less than an hour, the Continental Tire championship is made up of endurance contests featuring multiple drivers and scheduled pit stops. In the Street Tuner category, the Compass360 duo of Ryan Eversley and Kyle Gimple headed to Lime Rock with their Honda Civic Si locked into a tight championship battle with no less than five other BMW and Mazda-mounted teams. But at the end of two hours and thirty minutes of hard-fought competition around the short, but quick, Lime Rock circuit, a fifth-place finish for the Burton Racing duo of Terry Borcheller and Mike LaMarra was just enough to edge Eversley and Gimple, who finished sixth, for the championship by the narrow margin of just nine points. Still, it was an encouraging Continental Tire season for Honda, highlighted by three teams sharing the victory podium at The Mid-Ohio Sports Car Course in June, led by the RSR Motorsports Honda Civic Si of Tom Dyer and Andrew Novich. Local favorite HART – made up of associates from Honda of America Manufacturing – finished second with drivers Chad Gilsinger and Michael Valiante; with Gimple and Eversley third. The cars look really amazing with the wrap.I wish I was able to attend the championship.